Softwood, chipboard, wood core plywood, fibre boards (3-30 mm), laminated panels, clean surface. Softwood (4-50 mm), chipboard, wood core plywood, fibre boards, quick cut. 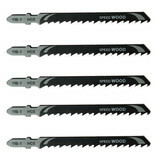 Clarke Wood cutting Jigsaw Blades – pack of 5. 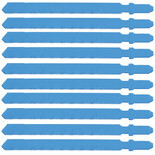 Quick, clean cutting blades suitable for Clarke CON750, CJS20Li and other bayonet fitting jigsaws. *Image for illustration purposes only. 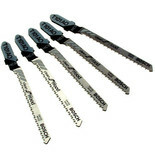 Clarke metal cutting Jigsaw Blades - pack of 5. 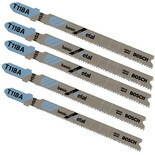 Quick, clean cutting blades suitable for Clarke CON750, CJS20Li and other bayonet fitting jigsaws. *Image for illustration purposes only. 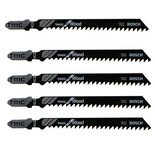 Clarke Wood cutting Jigsaw Blades - pack of 5. 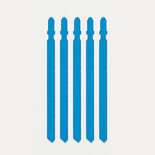 Quick, clean cutting blades suitable for Clarke CJS380 and other u-shank fitting jigsaws*Image for illustration purposes only. 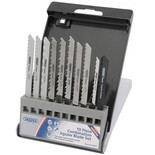 10 replacement metal jigsaw blades for the Clarke contractor jigsaw CON800. 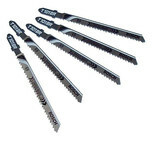 Clarke metal cutting Jigsaw Blades - pack of 5. 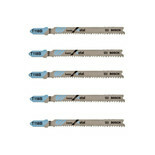 Quick, clean cutting blades suitable for Clarke CJS380 and other u-shank fitting jigsaws. *Image for illustration purposes only. 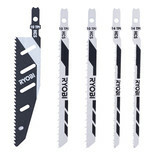 The Ryobi 5 piece blade kit universal shank fitment compatible with any jigsaw and is flash cut blade for wood and plastic applications. 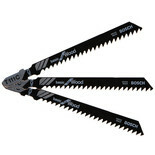 Ideal for cutting wood, metal, plastic and tiles these Draper Jigsaw Blades feature a universal fitting for easier attachment. Supplied in a display case for organised storage. 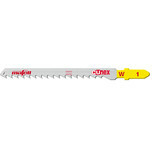 For use with Mafell P1cc jigsaw, the CUnex W1 3mm jigsaw blades are ideal for wood cutting applications. Supplied as a pack of two.